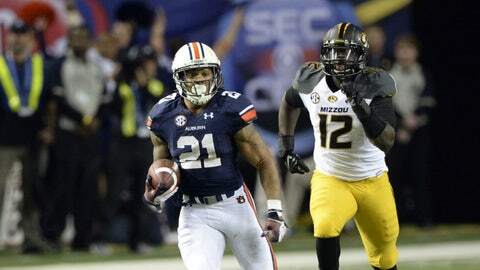 Tre Mason leads an Auburn ground attack that averages a national-best 335 rushing yards per game. Mason has 1,621 rushing yards and 22 TDs this season. The numbers are mind-boggling, as stunning as watching Auburn pulverize defenses. The Tigers had 545 rushing yards, with Heisman finalist Tre Mason racking up 304 yards alone, in the SEC championship game win over Missouri. Auburn hammers away at defenses, but not in an old school, 3-yards-and-a-cloud-of-dust manner. The Tigers average 6.5 yards per rush, using an abundance of talent, speed and misdirection. And then Tigers race back to the line of scrimmage and get set to do it all over again. Before a defense can recover, or substitute in fresh players, Auburn has snapped the ball again. It would make life easier if defenses could focus just on Mason, who has 1,621 yards and 22 touchdowns, but quarterback Nick Marshall has also run for 1,023 yards and 11 TDs. And running backs Corey Grant and Cameron Artis-Payne each have more than 600 rushing yards. And those first downs accumulate quickly, as No. 2 Auburn (12-1) leads the nation with 335 rushing yards per game. In its only loss, in September at LSU, Auburn still ran for 213 yards. This is the challenge that awaits No. 1 Florida State (13-0) when the teams face off on Jan. 6 in the BCS national championship game. In what could be the key matchup to the game, FSU must limit Auburn’s ground attack if the Seminoles are to win their third national title. FSU’s wake-up call came on Sept. 28, when Andre Williams accumulated 149 of Boston College’s 200 rushing yards. Since the BC game, FSU has allowed just 909 yards in nine games. FSU held Miami to just 83 rushing yards, and the Seminoles kept both Florida and Duke under 100 rushing yards. While FSU is 11th nationally against the run, the Seminoles’ numbers are deceiving because the first-team defense has often played just the first half or a portion of the third quarter. FSU has allowed five rushing touchdowns in 13 games, but none of them came in the first half. Auburn has made good defenses look bad. While the Tigers beat Alabama on a last-second field-goal return for a touchdown, itâs overlooked that Auburn ran for 296 yards against a Crimson Tide defense thatâs 11th nationally in rush defense. Mason has made defenses look silly. Against ranked teams this season, he had 164 rushing yards and a touchdown against Alabama, 115 yards and a TD vs. Georgia, 178 yards and a TD against Texas A&M, 77 yards and a TD vs. Mississippi and 132 yards and two TDs at LSU. FSU’s defensive players had seen pieces of Auburn games this season. But then they turned on the game film. There is a healthy amount of respect for what the Tigers do on the ground. ”I’ve been impressed with two things from Auburn’s offense: consistency and physicality,” FSU senior All-American corner Lamarcus Joyner said. ”They are a physical football team and they do it for 60 minutes. That’s a team with a bunch of talent, a bunch of intelligence and they wait for guys to make mistakes.